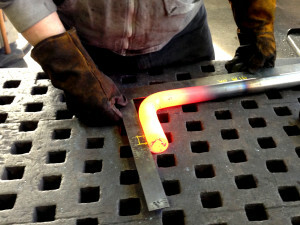 The designed shape of many items is best achievable through heating and forming. 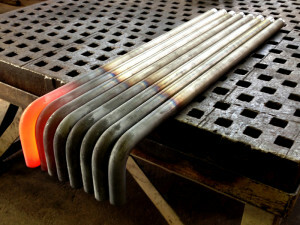 In this case, we function as a routine supplier to an OEM requiring a family of round bars to be formed to 90 Deg while hot. 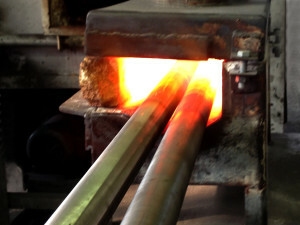 Heating is carefully controlled to insure that material grain size is maintained. While not a precision process, bending is skillfully performed in Pedrick power bending equipment, held to within print specification of +/- 1/2 deg. 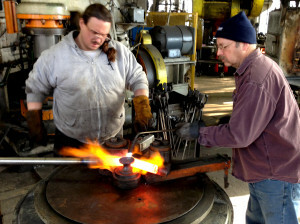 Our blacksmith shop offers a unique solution for manufacturers requiring such specialty operations in lot sizes too small to set up in-house capability. The material for these parts is supplied by our customer. We are also able to furnish components complete, including added value services such as machining, heat treating, NDT inspection / certification and a variety of finishing including painting or plating.